Playing with play dough develops various skills in children, like fine motor skills, hand-eye coordination, and more. 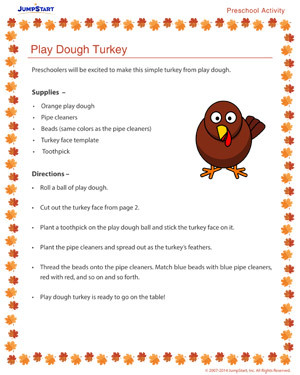 Here is a play dough activity for the kids that will transform into a beautiful Thanksgiving craft once completed. Help the kids make an easy turkey with play dough and place it next to the grand turkey meal on Thanksgiving! Browse more educational activities that will engage the kids in constructive play.